Depending on the look you are after you can go wild and hippy or elegant and luxurious! This also looks good on the bottom edge of a halter top. Even if you used to machine wash the dress or skirt before adding the fringe, you will want to hand wash it now to prevent the beads from tangling in the wash.
Measure the entire bottom edge of the clothing that will receive the fringe. You will want the fringe to go all the way around the bottom edge of all sides of a dress or skirt. You will want to add an extra couple of inches to fold over and secure the ends of the ribbon of the beaded fringe. Pin the satin ribbon of the fringe to the bottom inside edge of the skirt or dress hem, adjusting the ribbon so that it is hidden when viewing the dress from the right side. 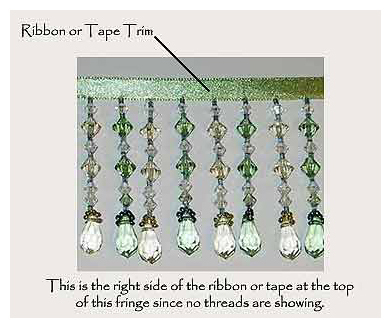 There is no right side or wrong side to the beads; however, one side of the ribbon may show threads, if so, place the "thread" or wrong side of the ribbon against the wrong side of the dress fabric. This will give you a nice satin ribbon edge on the back side of the hem.